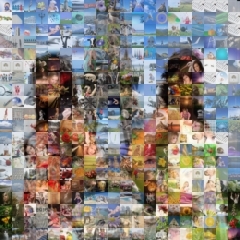 The Photo Mosaic effect allows you to create a photo mosaic. A photo mosaic is a picture that has been divided into rectangular sections, each of which is replaced with another photograph of appropriate average color. When viewed at low magnifications, the individual pixels appear as the primary image, while close examination reveals that the image is in fact made up of many hundreds or thousands of smaller images. Use this option for square tiles.